Update 13th November 2017: WE ARE DELIGHTED TO ANNOUNCE THAT WE REACHED OUR GOAL – WE HAVE RAISED €5.000! Thank you to your incredible support, animals like Galicia and Pablo are able to begin their new lives in safety at Wings of Heart Sanctuary. These babies, along with those animals whose stories we have shared over the last few weeks as part of the “Life Without Fear” campaign, live free at Wings of Heart thanks to the generosity of people like you. We are so grateful. The “Life Without Fear” series will introduce you to just eight of our hundreds of residents (and their closest friends) and share with you their stories. Over the course of two months, you will meet, among others: Agustin the pig, Parchis the goose and Evaristo the goat. Belonging to different species, with different personalities, likes and dislikes, what all of the individuals you will meet have in common is that they are “someone”. They are not, as they were considered by the people who brought them into the world with plans to raise them, kill them and make profit from their body parts, “something”. They are not commodities to be exploited but individuals with friends who they want to spend time with, love that they want to both give and receive and, above all, lives which they want to live for their own purposes. They are not ours to kill and consume. It is our privilege to be able to share our lives with them. We are delighted to share with you the first chapter in our “A Life Without Fear” Campaign. The campaign seeks to highlight some of the stories of our beloved residents who, without your help, would have had a very different future to the one that they are living today at the Sanctuary. We will start with one of our most special residents: a pig named Eneko. Eneko is a cross between a pig and a wild boar and arrived at the sanctuary in 2012 with his brother, Koke. Had the pair not been rescued, they would have been used as “bait” to train dogs to hunt boar. These affectionate, playful and, at time, naughty, babies very soon captured our hearts, along with those of the volunteers and visitors. Eneko left behind his difficult start in life and now, as an adult, he has become a calm pig who loves his home comforts. He adores taking long “siestas” and mud baths – particularly during the long hot summer in Madrid. He is very happy in his own routines and he loves to choose exactly how to spend his time. The only thing that will break Eneko from his daily rhythm is when he hears (or smells) that it is time for dinner! He is very intelligent and has learned how to help us clean his sleeping space. After five and a half years living with us here at the sanctuary, the two brothers had never spent a day apart until, two weeks ago, Koke fell ill suddenly and tragically passed away two days later. The vets did all that they could but there was nothing they could do to save the life of our beautiful Koke. Eneko is missing his brother terribly and now needs all the support that he can get. One of the greatest challenges faced by sanctuaries such as ours is that we are caring for animals who are bred by the farming industry to live just months or, at most, a few years. Animals exploited in farms have been manipulated over many years genetically so that they grow faster and to much larger sizes than is normal. This is done with the sole purpose of securing the maximum profit for the farmer from the bodies of the animals. That is to say, chickens are bred to produce more eggs than their delicate bodies can handle, cows are forcibly impregnated over and over to ensure that they continue to produce milk at levels which are totally unnatural and animals bred to be eaten are forced to gain abnormal amounts of weight, with no thought of the impact on their health. And to the farmers, there is little reason to concern themselves with the potential future health problems that the animals will suffer as a result of this cruel treatment for the very simple reason that these animals were never intended to have a future. In the moment that these animals become ill, or when their exhausted bodies simply cannot withstand the abuse any longer, they are taken to slaughter as they can no longer be used for economic gain. Their lives are so short that, shamefully, vets generally lack sufficient knowledge and experience to treat adult “farm” animals when they fall ill, as was the case with Koke. And this is where you come in. By supporting our “A Life Without Fear” campaign today, you will be giving hope to Eneko and his companions. You will be making sure that, when an animal becomes ill and needs veterinary attention, they will be given everything they need. You will be ensuring that we are able to open our doors to those animals who, while we have not yet met them, we know will need us in the near future. You will be giving a life without fear to an animal who needs you. In the second chapter of the “A Life Without Fear” series, we will share with a story which could have come straight out of a children’s fairy tale book. It is the story of Trasgu, a blind lamb who was, literally, thrown to the wolves. Trasgu’s amazing story began in Asturias, Spain, when the little lamb was cruelly thrown into the enclosure of a pack of wolves with the intention that she would be eaten alive. Incredibly, instead of attacking her, the wolves took her in and protected her. Astoundingly, the baby sheep remained completely unharmed. When the story came to light and a complaint was made about the incident by a local animal protection group, Trasgu was rescued and brought to the sanctuary. It was only on her arrival that we discovered she was almost completely blind; possibly as a result of the blow to the head she suffered having been thrown with force, and from a great height, into the wolf enclosure. When she arrived at the sanctuary, she was frightened and this, coupled with her lack of sight, meant that Trasgu initially could not be with the other sheep who live here at the sanctuary. Our team became her companions and playmates and she gradually become more confident as the weeks and months went by. While Trasgu loved to play with her human friends, we knew that our company was no substitute for that of her own kind so we were left with the conundrum of how to socialise Trasgu with the other sheep without her getting hurt, lost or confused. The solution came to us in the form of a gentle and friendly sheep named Paco. Paco had befriended little Trasgu and he became the sheep that Trasgu trusted most at the sanctuary. But Trasgu could easily lose her friend among the dozens of other sheep here and, when she did, she would become anxious and upset. So, we decided to give Paco a bell, so that Trasgu could find him. Trasgu immediately learned that the sound of the bell would guide her to her best friend. She no longer lost him in the herd and she followed him everywhere. After just two days, Trasgu had gained enough confidence to simply be with the rest of the herd and we removed the bell from Paco. 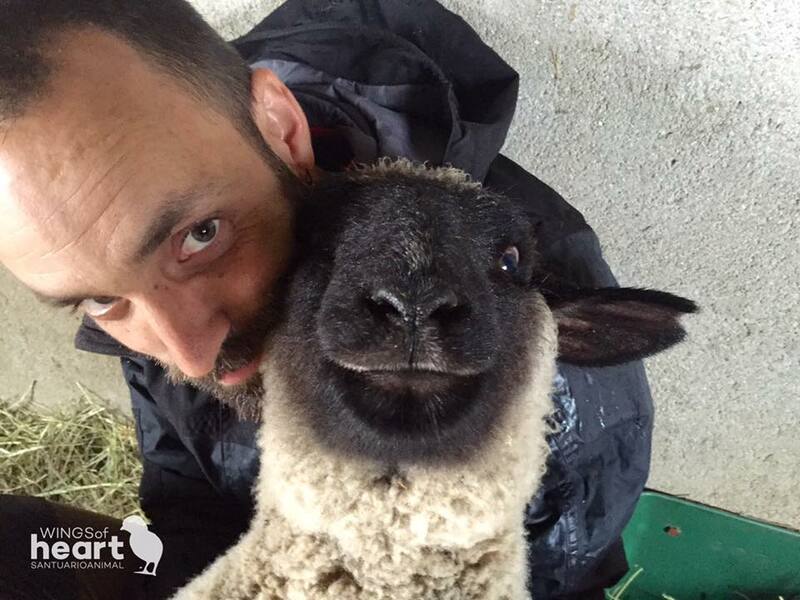 Trasgu now lives happily as part of her huge sheep family at Wings of Heart Sanctuary. Thanks to love, friendship and patience, the little blind lamb who was destined to be eaten alive by wolves was saved. Trasgu now lives A Life Without Fear. In the last few weeks, three more baby lambs have arrived at the sanctuary in need of our help. We know that more will come in the next few months. Thanks to your generous support we are able to make the same promise to our newest arrivals as we did to Trasgu when she first joined us. From the day that they set foot in the sanctuary, we promise that they will life A Life Without Fear. We don’t know much about where Parchís and his best friend, Oca, came from. They appeared one day on the streets of a Madrid suburb, lost, frightened and huddled together in an attempt to feel safe as people passed by, looking at the two little geese with curious stares. The pair would not have survived for long on the streets and, luckily for them, a young couple managed to catch them up and take them to their apartment. That young couple saved their lives. The terrified little birds were given a blanket, a box where they could sleep, hide and feel safe and a bath, which served as a swimming pool. Of course, Parchís and Oca could not spend their entire lives in an apartment in the city, so the young couple began to search for a forever home for them. So, it was shortly afterwards that we welcomed Parchís and his friend to Wings of Heart and it took them no time at all to establish themselves as members of the family. With their new house, their new swimming pool and their new friends, the pair had come home. Now, Parchís is one of the most confident, and comical, members of our family. He explores the world using his beak and hates to miss out on anything that might be happening around the Sanctuary. If there is a commotion going on, you can guarantee that Parchis is in the middle of it, ensuring he has a front-row seat. Parchís loves people and has the sweet habit that he would have learned from his mum and siblings of following us around as we get on with our day. Thanks to the support of people like you, our sweet, funny Parchís was saved and now lives a life without fear. Evaristo came to us in February of last year as a baby. His cruel fate was to be auctioned off as a raffle prize at a fair in Madrid. The selling point of the auction was that the winner could “take their food home while it was still alive”, kill him and serve him as their dinner. Evaristo was just a baby – full of fear and just desperate for someone to love him. Thankfully for him, he was rescued and came to live with us here at Wings of Heart. Right from the start, Evaristo was a sweet and affectionate little goat who adored the company of people. He always sought our attention and, if he didn’t get it right away, would pursue us until we succumbed to his charms. Today, at a year and a half old, he remains exactly the Same. He loves being in the middle of everything and having all eyes on him. Above all, he just wants affection. He doesn’t always make it easy for us to get on with our work because, as soon as he spots us, he runs over, pats us with his little hoof to ask for a cuddle or, if that doesn’t work, simply climbs on top of us and stands awaiting his prize: kisses and hugs. He may not make it easy for us to get things done, but he certainly makes it easy for us to love him. Evaristo cannot help but make everyone he meets smile and laugh at his antics. As he grew bigger, we tried to move him from the nursery – where new arrivals and young animals live – to join the flock of adult sheep who live in a larger enclosure together. While Evaristo likes to say hello to everyone and see what is happening, he kept escaping from the large enclosure and we would find him at the entrance of the nursery trying to get back in to play with his best friends: Bimba and Domingo. He has decided that the nursery is his forever home and we are happy to let little Evaristo choose where he wants to be. Evaristo, like all his companions, was rescued and freed from the cruel destiny for which he was born: to become a plate of food. Thanks to the support of people like you, we can continue to give goats like Evaristo or little Galicia, who we rescued a few days ago, the life they deserve. We can give them “A life without fear”. Will you help us to continue saving lives? The star of our fifth chapter of our “A Life Without Fear” series is Manuel, a little bull who arrived at Wings of Heart along with his best friend, Ruth, back in 2012. The two babies were terrified when they first arrived and it’s not hard to understand why. Manuel and Ruth came from a farm breeding bulls for the bullfighting industry. The options which lay ahead of Manuel largely depended on how much he could withstand before his body succumbed to the torture that those who sought to exploit him had planned. It may have been that Manuel died at just a few months old in a school where children who aspired to become bullfighters learned the first steps in torturing young animals like Manuel. If he survived that period, he may have lost his life at just one or two years old during a bull festival where he might be stoned, stabbed or dragged by ropes until he suffered a painful, terrifying and lonely death as people around him laughed and cheered at his suffering. If he survived to three or four years old, he would likely have been publicly tortured and killed in the bullring, to the sound of deafening cheers. He would have been killed by the hand of a man who perhaps once learned his “skills” at bullfighting school by attacking and killing babies, the same age as Manuel when he arrived with us. Or perhaps, like half of all bulls bred to enter the bullfighting industry, he would not have been considered “angry” enough to use in fighting and simply be sent to the slaughterhouse to die. Instead, Manuel and his beloved Ruth were rescued. And so began their lives in freedom. Manuel was given the chance to live A Life Without Fear. Before he arrived at the sanctuary, no human being had ever shown him any kindness and so his reaction to us was aggression. On the first day, this brave little bull charged us if we came too close – defending himself and his friend from the beatings that we could not explain to him were never going to hurt him again. As he slowly realised that we meant him no harm, his aggression turned to fear and he would do all that he could to avoid being in the same space as us. At the slightest sound or movement, he would dash to be next to Ruth and Javi – his oldest and newest friends with whom he felt safe. Those who breed bulls for fighting do not let the animals see human kindness. If they did, then the bulls would develop their naturally sociable behaviours, which would be useless to those who want to make a show of these animals being aggressive and dangerous. Bull breeders do not breed angry, dangerous animals, as they would like us to believe, but animals who are never given any reason to trust us. After time, Manual learned that not all people want to harm him. Manuel learned to trust us. Now fully grown, Manuel passes his days with Ruth, Javi and the other rescued bulls at the sanctuary. Manuel spends his time playing and running in the fields, sleeping under the shade of a tree with his friends, watching the world go by from the top of the hill or grazing quietly in the cool evenings at the sanctuary. Manuel’s future could have been so different but, thanks to the support of people like you, we were able to help him. We were able to give him and Ruth the life they deserved. Because no baby should be born for the purpose of being tortured for “entertainment” and because every animal deserves to live A Life Without Fear. We have just two weeks left until the end of our Life Without Fear campaign and there is still a long way to go before we reach our target of €5,000. Thanks to the generosity of people like you, we have already raised €1,500 – donations that will provide medication, food and care for our most recently rescued animals. BUT if we do not reach our target of €5,000 in the next two weeks, we will LOSE the money already raised and end up with nothing! As such, we are asking for your urgent help in sharing and supporting the campaign as it comes to its vital last days. Please help to ensure that we do not lose this amazing opportunity to receive urgent support for the animals. This week, we would like to share the sixth story of our series. Today, you will learn about the rescue and rehabilitation of Rita the donkey and her little family. The family of donkeys came from a horrific situation to live in freedom and safety with us here at wings of Heart. Read on to find out more about our beautiful Rita. One March morning in 2013, we received a call for emergency help. In the municipality of Labastida, in Vitoria – Gasteiz, a family of donkeys which had been brutally mistreated for years needed a place to go. These three donkeys, mother, father and son, had been seized by the Provincial Council of Alava, after repeated complaints, along with other animals such as dogs, goats and two rabbits. A local resident said that the site where the animals were being kept had no licence of any kind. Despite this, the local city authorities had donated the farmland where animals were being hoarded and kept in appalling conditions. Tied, chained, without veterinary care or proper food, it was only thanks to the secret intervention of concerned neighbours that any of the animals survived. Unfortunately for the goats, by the time we learned of the situation, it was too late. The defendant got rid of them when he found out about the complaint. We don’t know to this day what he did with them. Rita is the mother of the family. She is a donkey that was abused and had marks all over her body when she first came to us. When she arrived, we were appalled by the poor condition of her coat and saddened to see how submissive she was. She was suspicious. Not as suspicious as Martin but when you raised a hand to caress her face, she backed away, afraid of the hand delivering a blow. With time and socialisation, Rita has regained an impressive shine on her coat, she gained healthy weight and, importantly, we saw her self-esteem grow. Rita’s recovery is undoubtedly thanks, in part, to her son and his infectious love of life. In part, the love and care she has received at the sanctuary has also helped her. Here the animals are free to enjoy their lives and there is something contagious about that freedom of freedom and safety. Rita has turned into a loving and affectionate donkey who, although is still wary, allows herself to be embraced and has learned to accept that affection and tenderness are things to be enjoyed. Now elderly, Rita likes to spend most of her time with her best friend – another elderly donkey named Moni. The pair like to spend their time wandering round the sanctuary at their own pace, eating, sleeping and paying visits to their carers for some affection. The traumatic memories that Rita carried with her for so long are now long in the past and she can breathe easy because, in the final years of her life, she is free. Now Rita lives a life without fear. We are now just a ONE WEEK away from the end of our A Life Without Fear campaign and now we really need your help to make it a success and reach our €5.000 goal. If we do not reach our target, we will receive NONE of the donations pledged so far! Since the campaign’s launch just six weeks ago, we have shared the stories of six Wings of Heart residents – helping to give you a glimpse of the lives that the animals under our care lived before coming to us and the incredible strength and perseverance that they have shown in overcoming their traumatic past. Since the campaign began, we have also welcomed new arrivals to the sanctuary. These new arrivals are sometimes just babies, like little Galicia, and they need our round-the-clock care to help them get well and begin their new lives. But with new arrivals comes new costs – particularly medication and vet’s fees – and for this reason the Life Without Fear campaign is so important. Please help us today to reach our target of €5.000. You will be helping animals like Galicia and Pepa, who is the star of this week’s Life Without Fear update, get the second chance in life that they deserve. Pepa was found, collapsed and close to death in the middle of nowhere. She had been abandoned to die from starvation; that is, if the infection which riddled her leg did not kill her first. When our team answered the call for help from a kind person who wanted to help Pepa, they were shocked to see just how emaciated she was. It was hard to believe that she was still alive – you could see her bones jutting out from her skin and she barely had energy to lift her head. Her first few days at the sanctuary were touch and go and our team stayed up with her late into the night each evening. Each morning, our team approached Pepa with trepidation, dreading to find her gone, scared that she may have succumbed to her trauma and passed away in her sleep. But each morning, her eyes fluttered open and she greeted the team happily. She was a fighter. The vets diagnosed a severe infection in her joints, which had made her completely lame in one leg and was threatening to spread to her others. Combined with her already weakened state due to emaciation, the vet warned us that this beautiful girl might not make it. Pepa, however, had other ideas! Each day, Pepa stoically allowed us to treat her – even though her the physiotherapy and the constant cleaning of her wounds would have caused her considerable pain. She quickly learned to trust us – something that always amazes us about rescued animals. These individuals have been through so much and yet can learn to trust when shown affection and kindness. Pepa seemed to know that the pain she was experiencing in treatment was in her best interests. In fact, Pepa often tried to (literally) run before she could walk. 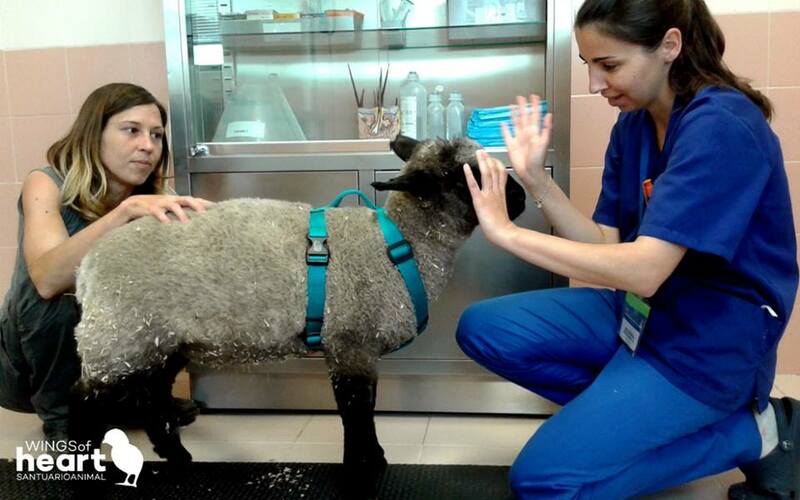 Her determination often brought us to tears as this brave sheep began to put on weight, began to walk tentatively on her damaged leg and began to relax into her new life in safety at Wings of Heart. The difference in Pepa after a month with us was incredible. We have rarely seen such a transformation from an animal so, so sick, to one who looks so healthy and happy. Just in the last few weeks, having been eager to join the – ever increasing – flock of rescued sheep at the sanctuary, we finally felt Pepa was well enough to be able to be with others. The day we let her into the large paddock, she behaved as if she was meeting old friends. She ran around and greeted everyone and was welcomed as if she had always been there. In her quieter moments, Pepa likes to come back to us and spend some time with her head rested in our laps, just as she did during those first painful days. Now though, her eyes close in contentment and her breathing is calm and steady. She knows that she is safe, and she knows that, from now on, she will live a Life Without Fear. It is the final chapter of our Life Without Fear campaign and, thanks to you, it has been a huge success. A few days ago, we reached our goal of €5.000, which we could not have done without you! We have decided to end the campaign not on a story from the past but of a story which is evolving right now at the sanctuary If you follow us on social media, you may have already met Galicia and Pablo, a goat and a lamb who have been rescued by us in the weeks that the Life Without Fear campaign has been running. They were rescued separately, both just days old when we picked them up, and have now become brother and sister. We wanted to share their heart-warming story to show you exactly where your generous support goes. In supporting our campaign, not only have you helped to spread the word and raise awareness surrounding our work, but you have, quite literally, made the rescue of these two wonderful new members of our family, and others who have arrived in the last few weeks, possible. It’s thanks to you that little Galicia and her little brother Pablo WILL live a Life Without Fear. From the bottom of our hearts, thank you for helping us to reach our target and we hope you enjoy this final chapter of the campaign. We share their stories not just to invite you into their lives but also to ask for your help. When we take in any animal, we commit to providing a safe home for life to them. Most importantly, we make a promise to each and every one of them: that from the day that they set foot (or hoof, or paw) into the sanctuary, they will be guaranteed A Life Without Fear. For animals who have suffered so much, this is the very least that we can promise. But we cannot fulfil this promise alone, and this is where you come in. 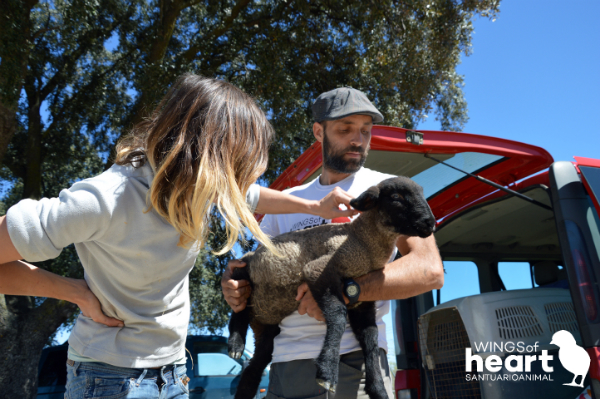 By supporting our “A Life Without Fear” campaign today, you will be helping Pepa, the sheep who was left abandoned to starve to death in the middle of nowhere, in her ongoing recovery. She never lost hope that she was going to survive and we committed to ensuring that she did just that. € 25 euro will provide colostrum for a lamb, like Paquita. € 1,000 euro will allow us to buy emergency first aid equipment (needles, gas, bandages and other equipment) to treat animals for three months.